child’s lunch bag. If so, then the Welch’s Fruit Snacks Lunchbox Notes Sweepstakes was made for you! 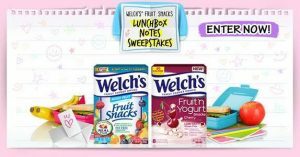 Enter to win awesome prizes simply by writing your note or submitting a photo to the Welch’s Fruit Snacks Lunchbox Notes Sweepstakes. Prizes will be awarded, so show us how creative you can be! One Grand Prize Winner will receive a check for $1,000 and a one-year supply of Welch’s Fruit Snacks consisting of 52 boxes. 5 Runners-up will each receive a gift certificate/check to a restaurant of their choice and a one-month supply of Welch’s Fruit Snacks. Self Disclosure: I received free samples to post this sweepstakes. Photo and info was provided and not affiliated with SoCal City Kids.